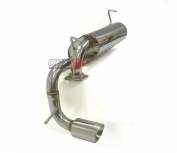 High Performance Track Proven Quality Exhaust Systems. Muffler and Tip are Durability and Longevity. Mandrel Bent T304 Stainless Steel Catback Exhaust System.Dual TIG weld.